My friends Jennifer and Matt have been very generous in supplying me with an assortment of Scallop Shells. My friend Bill has been requesting to purchase these almost as fast as I can make them! 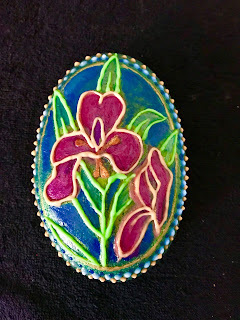 Between the supply and demand, my little rock business has taken on a whole new direction... painted shells ! 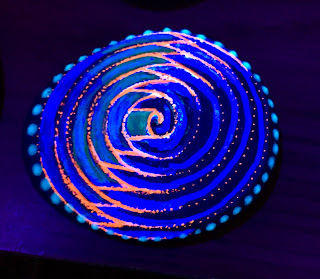 I wanted to take this one step further than just painting them in such a way as to have them glow in the dark or burst in color (like the one below) under a black light.These shells could also be functional. Aha! glue a night light to the back of the shell ! This idea was exciting to say the least, but then I thought about replacing the regular night light bulb with a black light bulb.Unfortunately, Christmas tree lights and outdoor lights did not come in that pure purple color that illuminates the florescent paint so nicely.Perhaps they will in the future, but not now. My experiments in 3D art forms have been fun an challenging. This design is one that I have drawn in sketch pads for some time,and have found it very intriguing. The spiral is an ancient symbol for gathering and centering.The spiral can also serve anyone who wants an image with which to focus, prior to achieving a meditative state. It has also been effective for the amusement of youngsters and magicians. Whether you are a meditator or not, viewing a spiral can have a mesmerizing effect. Comic books used to sell and item that was called a "Hypno-coin".This playful come-on had many a youngster sending their entire allowance to get a hold of one of these devices. My rock design is just a spiral made to look dimensional.Under a blacklight it takes on a beautiful color and can be quite stunning. I have had this rock on display since this past Fall and it is one of my better designs. 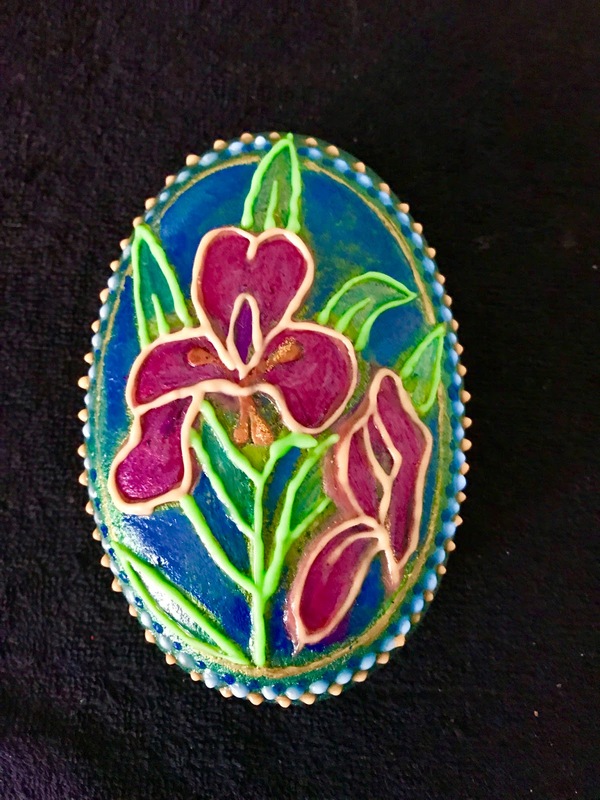 This was a study of an Iris that came out looking a little bit like a stained glass window, especially under a blacklight. The rock itself is rather large and yet symmetrical and smooth.This past week I freshened it up a bit and went back over the colors and puff paint that I use. I hope you like the result. i will have it back on the table this next weekend. Enjoy! It has been around twenty years since I first got familiar Photoshop. Lately, I have been exploring the idea of doing another series of posters like the ones that had been prepared for a library show back in 2010. I have learned a few things since then. First, I have learned not to be in a big rush to get a show up. Secondly, this is a whole different direction for me so easy does it. The process includes taking rocks, sketches and other images.All of this involves painting, scanning images, composition and modification in Photoshop, sending the prepared file to the printer, and then picking up the print. A little further down the road it involves getting a suitable frame and eventually showing the final piece. 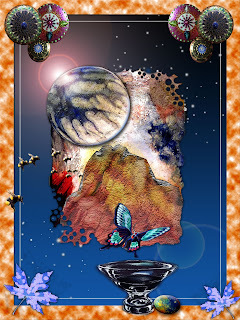 Below is something I call,"The Space between Worlds".I sent the file off today to the printer in Santa Rosa.